India is in the throes of what some are calling a “second freedom struggle.” Across the country, citizens are on the streets, in the courts and on the internet, fighting to break corruption’s chokehold on the nation. It is a critically important battle, not only for the future of India, but for global security — corruption in India enables some of the world’s most dangerous terrorist networks. In terms of Indian political corruption, the 2011 2G-spectrum scandal alone is estimated to have lost Indian taxpayers close to $40 billion. And, as soon as the money needs to cross borders, say to get to a Swiss bank account where it can be washed clean, an Indian politician on the take goes from being a national security concern to a global security concern. That is because a preferred method of transferring illegal money is called hawala. A very simplified version of how the hawala system works is shown below in a graphic from INTERPOL. Say Abdul in New York wants to transfer $5000 to his brother Mohammed in Pakistan. Abdul would go to a local New York hawala trader and give her $5000 cash. The New York trader would then call her colleague in Pakistan and instruct him to pay $5000 cash (in local currency) to Mohammad. And that’s it. The Pakistan trader might get the money back from the New York trader through money transfers the other way, by doctoring invoices using participating import/export companies or other methods. In the meantime, Abdul sent the to money to Mohammad in hours and there is no official trace of the transaction. 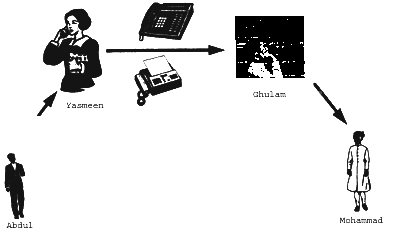 Due to the illegal nature of the process, the people transferring money (in this example Abdul and Mohammad) are now open to blackmail, giving the hawala traders and their associates leverage over their clients if needed. For hawala to work, there has to be a high level of what Interpol calls ‘trust’ between the hawala traders. With hawala, that ‘trust’ is often guaranteed by brutal enforcement. If the money disappears en route, the hawala trader involved is likely to be ‘disappeared’ as a result, possibly along with his or her family. The need for this high level of enforced ‘trust’ is why many hawala networks are controlled by terrorist and related criminal groups. The terrorists are not only willing to be brutal, but also require the quiet transfer of large amounts of untraceable cash. In a coordinated attack, in Mumbai on July 11, 2006, terrorist bombings on trains killed over 200 people. $10,000 that was used to carry out the attacks came from Saudi Arabia to India via halawa networks. The material recovered from Abbottabad shows Osama Bin Laden spent much of his time going through the “corporate” account books, tracking money generation (often through decidedly unspiritual means such as drug dealing) and cash flows. Like a criminal Western Union, terrorism financiers use vast international hawala networks to move money around the world quickly and quietly. Due to their effectiveness, those same hawala channels also attract cash flows from other illegal sources, including arms traders, prostitution, narco-traffickers and human traffickers. The problem is compounded when these same networks are used by those whose job it is to shut down criminal networks, such as (corrupt) politicians and law enforcement. As all these money streams combine and flow through the same channels, each participant, from terrorist to politician, needs to protect the whole system in order to protect their own money flow. Very broadly, those common interests result in a division of labour. The terrorists and associated criminal groups provide the system ‘hardware,’ such as physical money transfer, enforcement, etc. Meanwhile the corrupt politicians and associated ‘legitimate’ groups such as (compromised) police, bureaucrats, media, etc., provide the system ‘software’ by keeping cases out of court, losing files, ensuring no coverage of embarrassing incidents, etc. Recently J. Dey, one of Mumbai’s top investigative journalists was shot dead. On the list of suspects are politicians, terrorists, gangsters, industrialists and policemen. It pretty much sums up what has happened to India. As dirty money flows between politics, extremist groups, narco-traffickers, business, media houses, and police, it mixes together forming a torrent of intermingled corruption that is drowning the security of the nation, and pouring over the border, carrying terror and crime with it. Those dynamics have been on display in the case of Hassan Ali Khan. Khan is sitting in jail in India awaiting trial on charges of running a massive, high value hawala network for an astoundingly varied cast of top-level players, from narcotics dealers to industrialists to politicians. Even Saudi arms broker Adnan Khashoggi’s name has come up. In the case of Hassan Ali Khan and his associates, the sums were too large to be moved around invisibly like Abdul’s $5000. As a result vast amounts, sometimes up to $8 billion, periodically popped up in tax haven bank accounts, creating a brazen paper and e-trail. For example, according to investigators, when millions were transferred to a Khan-linked bank account for the purchase of a hotel in Switzerland, it came with an unusual note attached. Deal for purchase of property i.e. Chateu Gutsch [sic] in Lucerne was finalized and during payment, USB [bank] informed that USD 300,000,000 the fund have arrived tagged with comment “Funds from Weapon Sales. The note shows just how sure Khan and others involved were that they were protected from prosecution. And, until now, people like Khan had good reason to feel safe. Among Khan’s known associates were three Indian Chief Ministers and a top member of the ruling Congress Party. To protect themselves, they have to protect him, and the system he represents. And so, the case against Khan languished. Interrogations were cursory, files were sloppy, deadlines were missed. the issue of unaccounted monies held by nationals, and other legal entities, in foreign banks, is of primordial importance to the welfare of the citizens. The quantum of such monies may be rough indicators of the weakness of the State, in terms of both crime prevention, and also of tax collection. Depending on the volume of such monies, and the number of incidents through which such monies are generated and secreted away, it may very well reveal the degree of ‘softness of the State.’ […] If the State is soft to a large extent, especially in terms of the unholy nexus between the law makers, the law keepers, and the law breakers, the moral authority, and also the moral incentives, to exercise suitable control over the economy and the society would vanish. Large unaccounted monies are generally an indication of that. The court instructed: “Follow the money.” It ordered that the Khan case be taken out of the hands of existing (failing) investigative units, and be given to a special investigate team composed of top officials comprising, among others, two former Supreme Court Justices and the Director of the Research and Analysis Wing. If properly investigated, the case has the potential not only to bring down governments, but it could also be a huge blow to global terror, drugs, child prostitution, and human trafficking networks. Needless to say, those networks are fighting back. At midnight on June 5th, tens of thousands of fasting, sleeping anti-corruption demonstrators were stormed by the police and cleared from their demonstration site in central Delhi. Reportedly ordersfor the action came from the very top. But the anti-corruption elements of the system are standing firm. The Supreme Court has ordered the Government to explain its actions on the night of June 5th. Point, counter-point. Similarly, this week, anti-corruption demonstrator Anna Hazare and hundreds of his supporters were arrested. Subsequently, tens of thousands took to the street to protest the arrests. India is not new to demonstrations, but this fight back mood is different. It will not go away. And it’s spreading. Sympathy protests have taken place in the U.S.,Singapore and Hong Kong. And there are more to come. It is fitting that the protests are going global. Political corruption in India, facilitated by hawala networks, has not only undermined India, it has compromised global security. For years some, like journalist and strategist M.D. Nalapat, have been warning about the deepening and spreading security vulnerabilities resulting from Indian corruption. Now, the Cassandras are being proved right. Luckily for those around the world concerned about terror, drugs, human trafficking and other multinational criminal organization, the Indian people, from the streets to the courts, are working hard to make India, and by extension the world, a more secure place. This fight concerns us all.